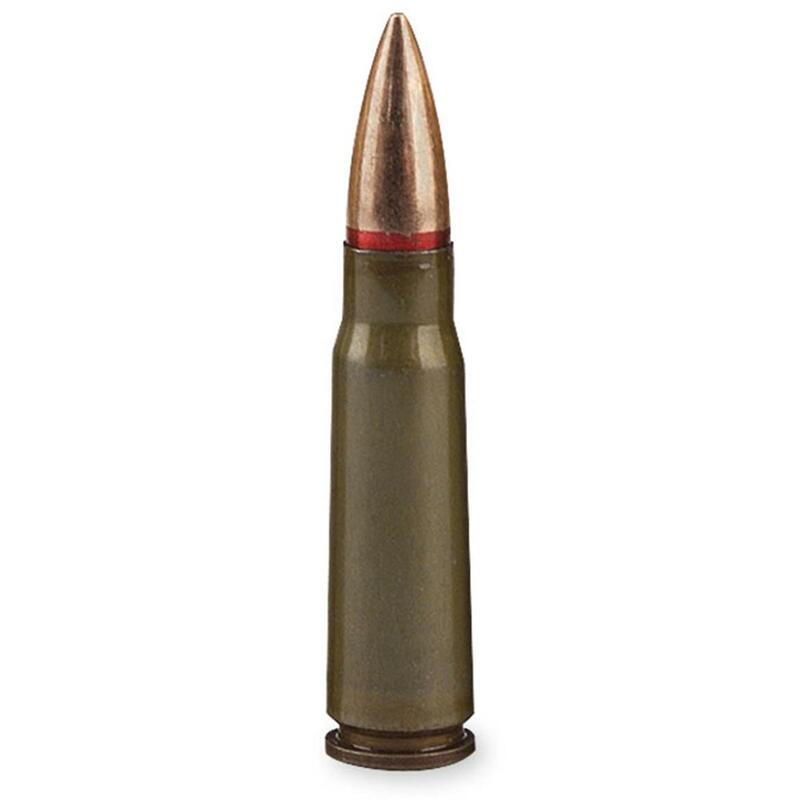 NEW production Wolf® Military Classic 7.62x39mm 124 Grain FMJ Ammunition. For hunting, varmint control and all-around plinking fun! A small order of new production military rounds were located, at a bargain price. Polymer coated, steel-cased Ammo is Berdan-primed and non-reloadable. Non-corrosive. Full metal jacket. Muzzle Velocity: 2,330 F.P.S. Muzzle Energy: 1,495 ft.-lbs. 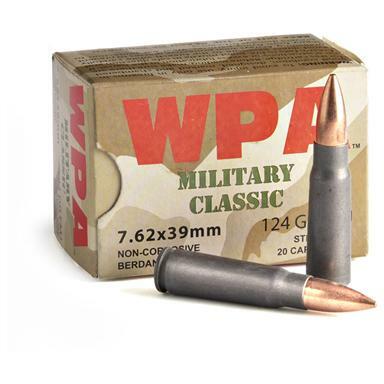 Wolf Military Classic, 7.62x39mm, FMJ, 124 Grain, 240 Rounds is rated 4.9 out of 5 by 51. Rated 5 out of 5 by Ralph from Great price A great price and quality ammo that shoots decent in my AK and SKS. Also the shipping was free which I really like. Rated 5 out of 5 by Daniel from Great ammo for a great price I have never had a problem with WPA products. They function very well in all my firearms that shoot 7.62x39mm. Sportsmansguide is very prompt on their shipping. It always gets here in a reasonable amount of time. Rated 5 out of 5 by Scott from Good ammo and great price this ammo runs through my WASR perfectly. This ammo was also designated a best buy by the AK Operators Union. You can watch their ammo review, gun review, etc. videos online. Rated 5 out of 5 by Mr Shifter from As Always Good stuff, as always, goes pow. Rated 5 out of 5 by SFmajor from Excellent Ammo Been using the WPA military brand for some years now. Feeds well, no FTF's or FTE's. You can't reload it, but at the price its hard to beat. Rated 5 out of 5 by Rich B from Great Price for Good Ammo This was a Memorial Day special but it was sure a great price for 7.62x39 ammo. Locally only available at half again the cost so a real bargin for me . Keeps my AK happy.. Rated 5 out of 5 by Daniel from Just what the shooter ordered! This ammo cycled fine no misfires or FTF. This ammo is great for target shooting inexpensive and reliable. Better function, longer storage life.